The pictures in this article are from private collectors. Please read my first article on fire making. Here you can read how fire invented through to the 1890`s. from rubbing on one another spontaneously. Accordingly, most people carried a match safe to house their matches. Wealthy people had match safes made of gold or silver, while common folk had ones made of tin or brass. The different patterns and types must run into many thousands. As well as plain and decorated square, oblong and round cases, a myriad of novelty shapes have been recorded They were also made in every conceivable material, including pressed brass, pressed tin, gunmetal, nickel silver, gold, ivory, and wood of varying types, early plastics like tortoiseshell and bakelite, and ceramics. Although the majority was made of inexpensive materials, some were made of precious metals or enameled. These precious metal cases typically had a gold wash interior to prevent corrosion by the chemically active match heads. Match safes at the moment can be bought for a very low price! Simple match safes in silver (without enamal) you can buy from around 20$ to 150$. Enameld match safes: Depending on what topic and from which manufacturer: Generally between 150$ to 1500$. Rare and important pieces obviously are higher in price. Picture from Skinner auctions. 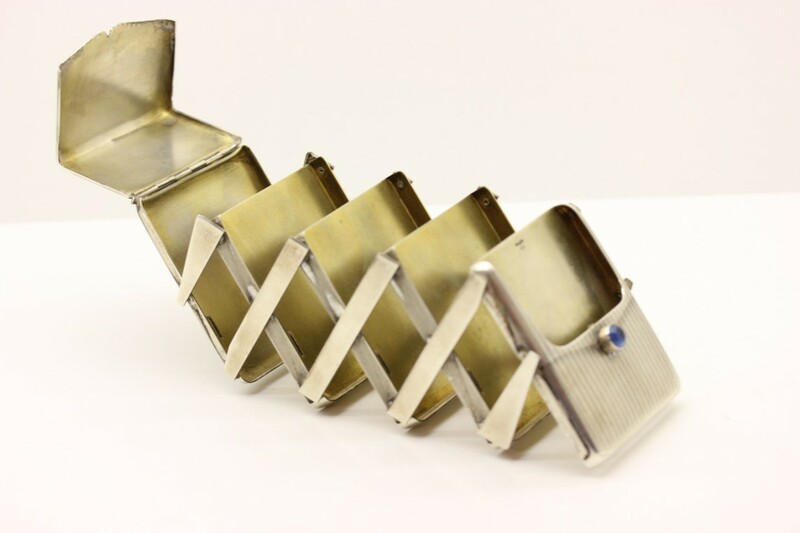 This match safe was made around 1905-1910, by the silvermanufacturer Louis kuppenheim from Pforzheim. 900 Silver / painted enamel hardglas. Match safe above: Nice Jugendstil. Made by Heinrich Levinger Germany. English import marks for 1901. Designer: Privat Livemont. Important is that the condition is good. Chips or cracks devalue considerable. 925 Silver / painted enamel hardglas. Match safe above: Louis Kuppenheim from Pforzheim. Made around 1905. Current technology was depicted in this scene. 800 Silver / painted hardglas enamel. 1903: Carl Auer von Welsbach, an Austrian chemist, discovered that ferro cerium (an amalgam of iron and cerium) produces powerful sparks when scratched. The alloy became known as Auer metal / Auermetal and was adopted for use as the 'flint' in cigarette lighters - the same flints are still used making possible the modern lighter. In 1907 the first factory to make Auermetal was opened and the rest is history! Over the ensuing years many styles and mechanisms were developed, but all used the same basic method and materials - flint and petrol. There was a flint and striking wheel to produce a spark, a wick soaked with fuel to carry the flame, and a fuel storage tank packed with sawdust (very frequent) or fiber (e.g. wool, cotton). 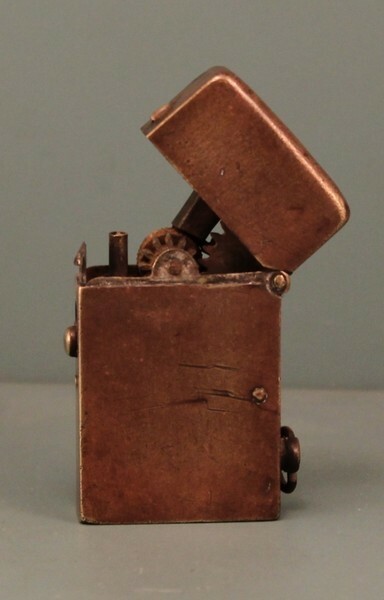 Lighters had become functional as well as artistic with the advent of the semiautomatic lighter, in which the user flips open the lid and a flint wheel simultaneously spins and ignites the wick. The development of lighters accelerated during World War 1. 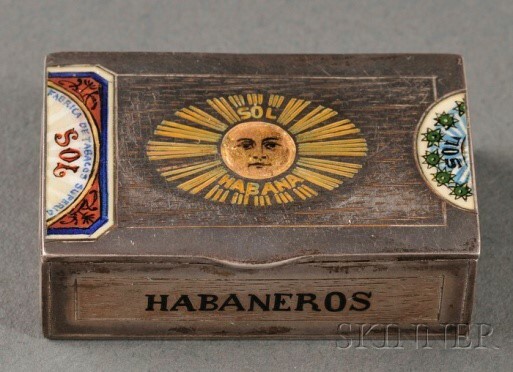 Now enjoy some lighters which were made from 1910 to 1915. Press button lighter in shape of a pocket watch. Made around 1911. By pressing the “watch crown” the lid flips open and the wick lights. By turning the “watch crown” the tinder cord can be adjusted. This lighter has a tinder cord and wick. Material Nickle plate. Value 150$ to 250$, depending on the condition. Above: RK Lighter 1911. Richard Kohn Germany. Also a press a button flip up lighter. These lighters were made in many different variations and finishes. Value between 50$ to 150$. The Roaring 20ties. The Art Dèco era. By the 1920s, right in the middle of the Art-Deco period, smoking became extremely popular. Lighters, cigarette cases, minaudieres and compendiums were right there to keep up with the trend. Ladies played a large role during this time: Emancipation, new clothings, new hair styles. Coco Chanel invented her first perfumes, now women started smoking and drinking in public, driving the automobiles and Voting was accepted. Lots of money was invested and spent in these objects during this time. Until the stock market crash in Oct. 1929. Dunhill enamel lighters and cases. Made by Louis Kuppenheim for Dunhill. All silver, made between 1925 - 1929. 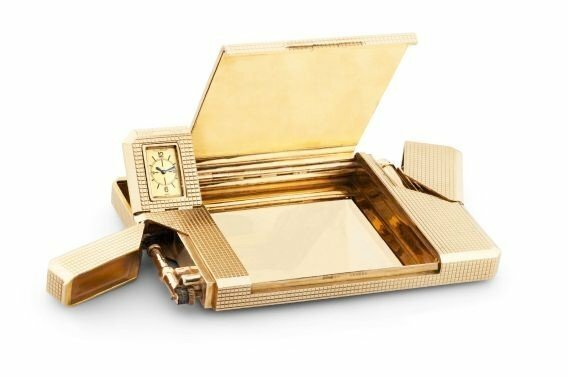 Above: Dunhill gold compendium /multifunkctional: Lighter, watch, cigarette case, pencil, tape measurer. Some compendiums have up to 10 functions. Value in Silver: Around 1500$ to 2500$. In Gold 3000$ to 5000$. Silver are from 925 Silver (92,5% Solid silver). Gold pieces were made in 9ct. (375), 14ct. (585) and 18ct. (750 = 75% purity gold). 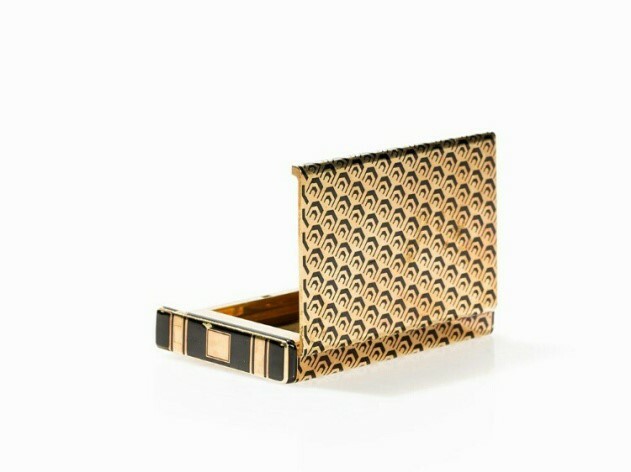 The minaudiere was designed with compartments which often included lipstick holders, compacts, mirrors, tortoiseshell combs, cigarette lighters and sometimes also watches. 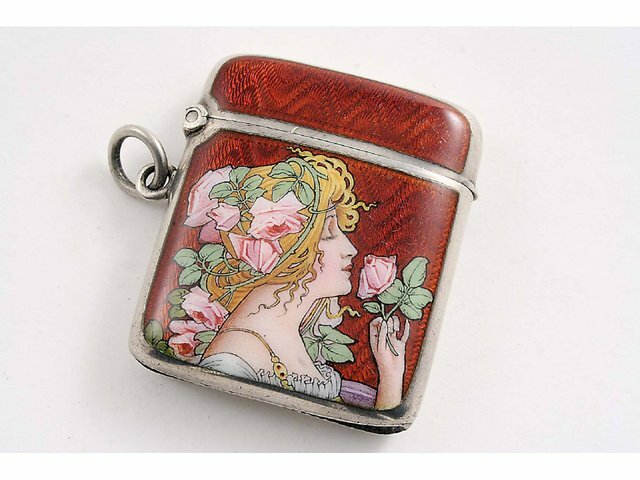 Cigarette lighters were an extremely important accessory. 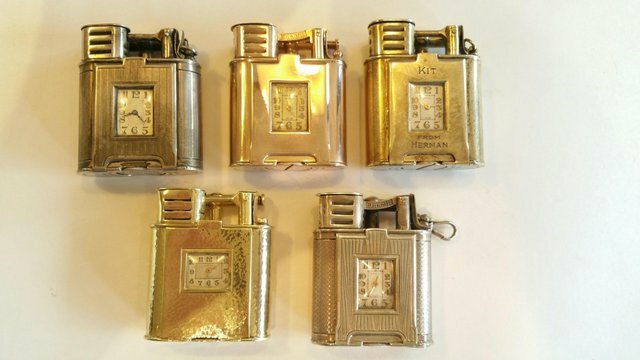 Dunhill made table lighters in various shapes and sizes, including a celebrated ball-shaped lighter in silver or gold. Pocket lighters with watches. Other companies made table lighters in glass and Perspex. Ronson combined a cigarette lighter and cigarette dispenser in the shape of a cocktail bar, complete with chrome trimmings and a barman shaking a cocktail. See picture below. The Bartender Lighter. 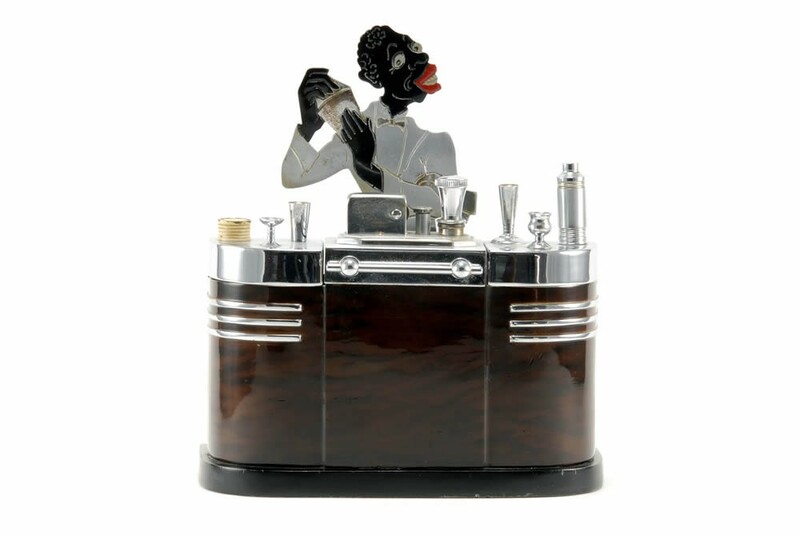 Made by Ronson, Newark USA, in the 1930ties. Metall laquered. Very heavy and quite large. On the left and right side you can find a cigarette compartment. Value ca. 1000$ to 1500$. Picture above: Cigarette Case and Compact. Silver and enamel. Made by Louis Kuppenheim, pforzheim. English import marks for 1927 and 1928. 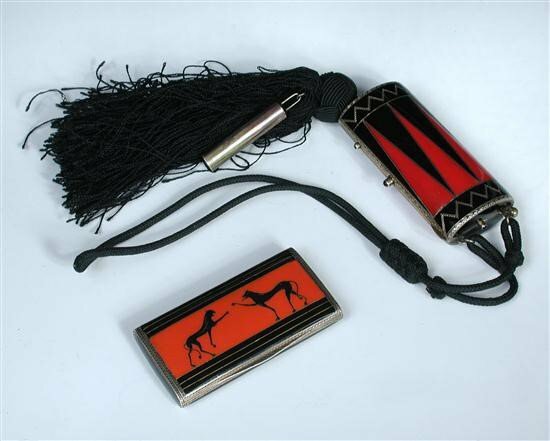 On the cigarette case you clearly see the Egyptian style which was very popular from around 1924 to the end of the 20ties, due to the discovery ofTutanchamun treasury grave in 1922 (discovered by Howard Carter). 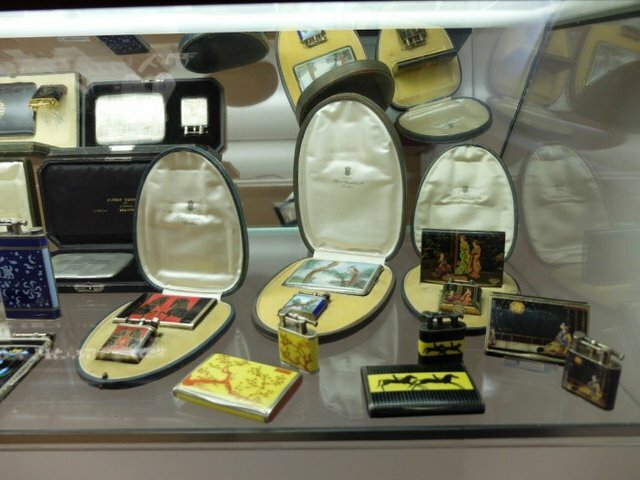 Such cigarett cases and compacts can be "sniped" at auctions for around 100$ to 1000$. 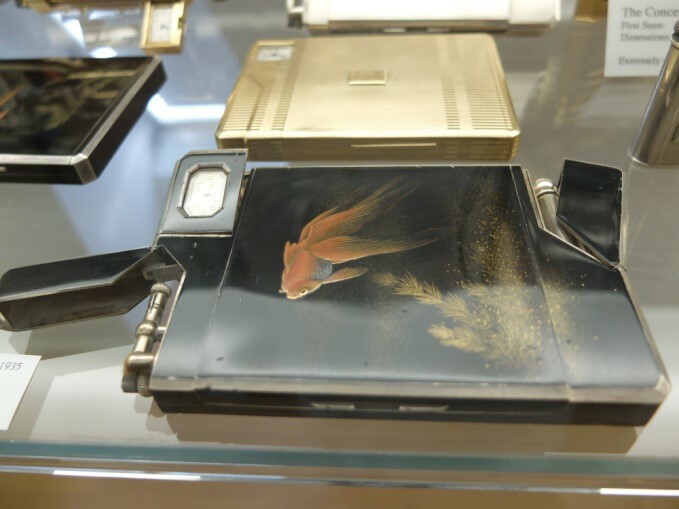 Here again depending on condition, design, maker......Like I paid 120$ for the cigarette case. The true value is around 800$. Above: 5 Dunhill lighters made by la Nationale Switzerland ca. 1926 to 1928. Silver and Gold. This is the Dunhill Unique Sports model. The Sports model was with a windguard. Value in Silver: Around 1000$ to 2000$. In gold 2000$ to 3000$. 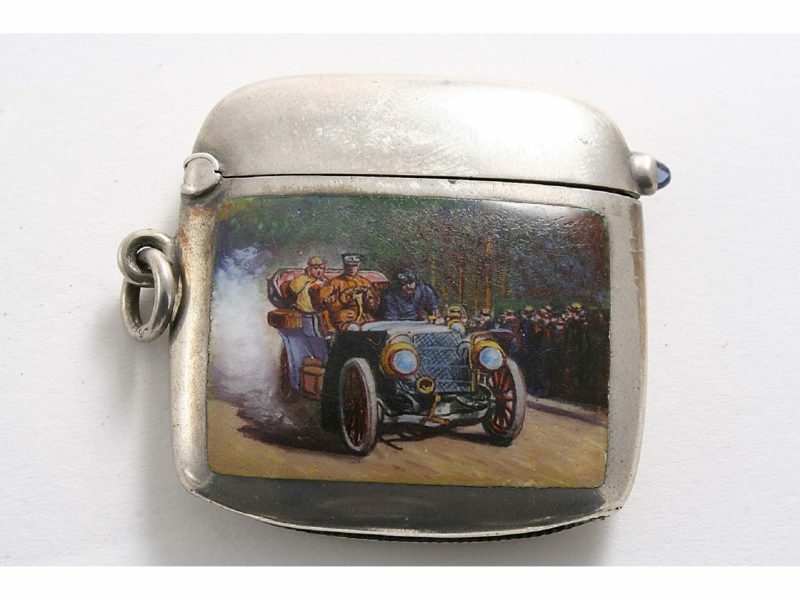 Silver and enamel watch lighters, often made by Louis Kupppenheim, are worth 5000$ upwards. But only in good condition! Above: As you see I like Louis Kuppenheim very much. This folding cigarette case with a saphire press button is quite rare and heavy. Weight: 400g. Value: Ca: 400$. Not much money for a piece of history! With a certain value due to the silver content......Have somthing made like this today by a well known brand and you will have to pay 20x as much! Above: Left: Dunhill Compact shaped as a lighter. Silver around 1930. The enamel was done by Kuppenheim. 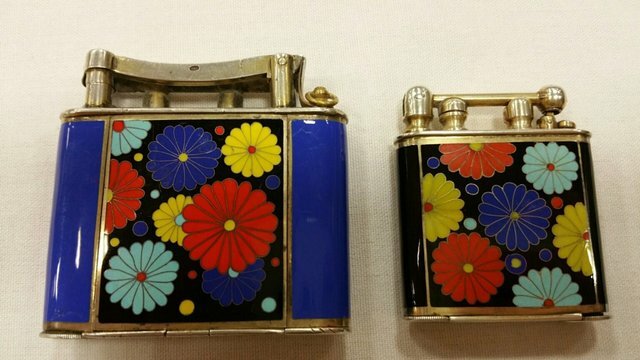 Right: Here you see the same enamel (also done by Kuppenheim) on a Douglas lighter from the USA. I hope you liked this post. The subject on lighters is fairly large, but you can find a lot more information online. Congratulations @mrde! You received a personal award!